According to Campaign Asia, "Vodafone Hutchison Australia has lost an estimated 1.5 million customers over the past two years, primarily because the company has not been keeping up with the surging demand for smart-phones." Nicole McCormick, Senior Analyst of Industry, Communications and Broadband with Ovum attributes the customer losses to ‘poor data experience with Vodafone during the period mid-2010 to early 2011, due to under-investment in the network”. Although now-ex Vodafone head Bill Morrow says the company has invested billions in the network, and launched its refreshed brand via the ‘Discover the new’ Vodafone marketing campaign, will this be enough to stem the tide of customers abandoning the network? Campaign Asia invited BrandMatters’ Managing Director Paul Nelson to address this challenge. You can read the full article here. 1) Operations: Vodafone needs to get the basics right, and continue to improve network reliability and coverage. It should focus less on competing on speed and more on reducing drop-outs and closing black spots. It needs to get itself into a position where it can expand its existing network guarantees, take accountability for service and coverage levels, and begin to rebuild trust. 2) Customers: Vodafone needs to turn customers into loyal brand advocates. It needs to improve its Net Promoter Score via a commitment to engaging deeply and frequently with customers. It should commit to acknowledging, listening, confirming and taking action on challenges expressed by customers. By aligning its internal and dealer audiences and focusing on delivering strong, localised customer service Vodafone can begin to rebuild loyalty and demonstrate customer service and satisfaction as a competitive point of difference. 3) Brand: Rebuilding the Vodafone brand with business customers is likely to be more challenging than rebuilding the brand among the consumer audience, a space where Vodafone’s challenger positioning has always resonated strongly. 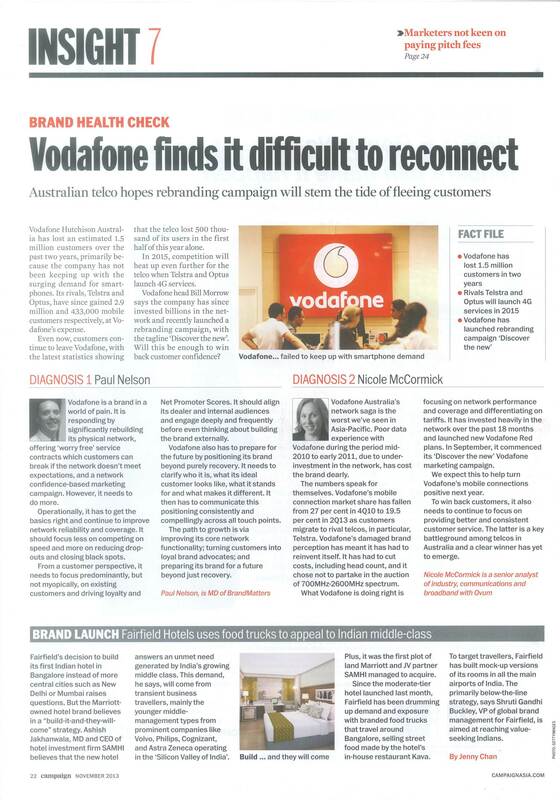 Vodafone must prepare for the future by positioning its brand beyond purely recovery. It needs to clarify who it is, what its ideal customer looks like, what it stands for and what makes it different. It then has to communicate its positioning consistently and clearly across all touch points. Unfortunately for Vodafone, it won’t be rebuilding its brand in a vacuum: key competitors Optus and Telstra are also committed to improving customer service, an area where telcos have typically performed poorly and where no brand is yet to emerge as a leader. Compounding Vodafone’s woes is the departure of Morrow, who in December 2013 was appointed as the new CEO of NBN Co. Changing CEOs is always disruptive to brand development, especially at such a crucial point in a brand’s recovery and when the departing CEO is as high-impact as Morrow. In 2010 BrandMatters wrote a blog post about how advertising alone can’t rebuild a broken brand, particularly a broken telco brand. For Vodafone there are no immediate or simple solutions to rebuild trust or facilitate business growth. It will be committed leadership and the consistent application of a large number of small initiatives that will build verifiable momentum over time.